After throwing pitches in the major leagues, baseball star Kenny Powers (Danny McBride) takes the ultimate demotion: teaching physical education at his former middle school. Nevertheless, Powers's truculent personality is still intact as he clutches to the vestiges of his fading celebrity - and schemes about returning to the stadium lights. 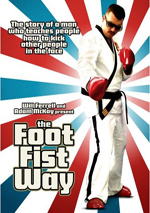 This hilarious series from HBO was executive produced by Will Ferrell and Adam McKay. To date, I have yet to like Danny McBride’s work in any of his handful of movies. 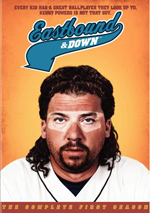 Despite that track record, I decided to give Eastbound & Down a shot – hope springs eternal! 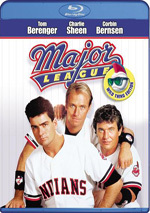 In this HBO series, McBride stars as washed-up former Major League Baseball star pitcher Kenny Powers. I’ll look at the six episodes of Season One in the order broadcast. The plot synopses come straight DVD’s menus. Maybe I only feel this way because I went into the series with incredibly low expectations, but I must admit that “Chapter One” includes some reasonable entertainment. Heck, I even chuckled a few times, and that’s more than I expected. Granted, one must suspend disbelief to get into the show - Kenny gets away with a ridiculous amount of awful behavior – but at least “Chapter One” manages to start things on a decent note. While still not terribly funny, the series at least continues to be interesting through “Chapter Two”. Actually, the episode opens up Kenny a bit and makes him more three-dimensional and human. In the first show, we were stuck with 98 percent Crude Kenny, while this one knocks that down to about 75 percent. Granted, much of the character’s awful appeal comes from his crudeness, but three hours of mean, self-absorbed Kenny would get to be too much. The character still may get old by the end of the season, but the signs of sensitivity here add a little balance. We can assume that Kenny squandered his baseball earnings due to his general stupidity, but I wish the series threw out a line or two to clarify this. Kenny wouldn’t be the first multimillionaire athlete to throw away his riches, but I still think the program should explain this. Other flaws in logic mar “Chapter Three”. Kenny totally disrupts her home life and Cassie still seems to want to help him? Kenny’s a fat, obnoxious loser, and April’s falling for him? The episode throws out too many competing plot lines, and none of them really pay off in this mediocre show. After the multiple story lines of the last episode, “Chapter Four” manages to become more focused. Much of it revolves around the activities at the cookout, so that gives it a tighter feel. I’m not wild about the contrived ways the series is using to connect Kenny and April, but since this means we get to see Katy Mixon shirtless, I won’t complain too much. After the blah “Chapter Three”, this show gets the series back on track. After four episodes of super-obnoxious Kenny, we get a totally different side of him here when he tries to be an Average Joe. That twist adds a nice spin and makes the show more entertaining than we otherwise might expect. Throw in good cameos from Robinson and Gina Gershon and “Episode Five” is a solid one. Season One wraps up in a pretty good fashion here. It demonstrates that the series developed a lot more drama and character than I expected when it started. It avoids mawkish sentiment, though, and throws out a pretty decent twist at the end. This isn’t the funniest or most involving series, but it’s better than I ever expected, and “Chapter Six” finishes things in a manner that makes me curious to see Season Two. Eastbound & Down appears in an aspect ratio of approximately 1.78:1; the image has been enhanced for 16X9 televisions. This was a consistently average presentation. Sharpness looked mediocre at best. Close-ups demonstrated decent delineation, but wider shots could be rather soft and tentative. No issues with jagged edges or shimmering occurred, and I noticed only minor edge enhancement. However, grain became somewhat heavy at times. Colors were pretty bland. The shows featured a natural palette that never looked poor, but the hues also never came across as too lively or dynamic. Blacks were reasonably dark, and shadows were acceptable, though the grain made low-light shots murkier than they should’ve been. I thought the series was watchable and that was about it; it tended to look pretty flat. While more impressive than the visuals, the Dolby Digital 5.1 soundtrack of Eastbound and Down was unexceptional. The soundfield largely focused on music. The songs and score boasted good stereo imaging and featured nice reinforcement from the surrounds. Otherwise the track remained generally uninspired. In terms of effects, the side and rear speakers offered environmental bits but not much more. Audio quality was fine. Speech always seemed natural and concise, and the lines lacked edginess or other issues. Effects were so low-key that they didn’t provide much range. Those elements were clear, though, and without problems. Music remained the best part of the track, as the score and songs seemed dynamic and full. I thought the music sounded good enough to boost my grade to a “C+”, but the track never impressed in any way. When we head to the extras, we start with audio commentaries for three episodes. These cover Chapters One, Four and Six, as we hear from consulting producer/director David Gordon Green, writer/actor Danny McBride, writer/actor Ben T. Best, and writer/director Jody Hill. They discuss the origins of the series and its title, cast and performances, story/character notes, cut/trimmed scenes, sets and locations, music and visual choices, and a few other production areas. The chat for Foot Fist Way included some of the same participants; it wasn’t very good, so I feared these tracks would also be dull. Happily, they turn out pretty well. The guys throw out a few jokes, but that side doesn’t dominate. They provide a lot of good insights into the series and make these commentaries enjoyable and informative. Next comes a featurette called Making Eastbound & Down. 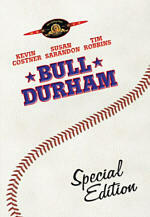 This 12-minute and 12-second piece includes notes from McBride, Best, Green, executive producer/episode director Adam McKay, executive producer/guest actor Will Ferrell, executive producer Chris Henchy, producer Stephanie Laing, and actors Katy Mixon, Andrew Daly, Craig Robinson, Gina Gershon and John Hawkes. The program looks at the series’ origins and developments, cast and characters, shooting in North Carolina, improvisation, and a few other production tidbits. At its heart, this is a promotional show, but it still provides some interesting elements. In particular, the footage from the set proves entertaining. After this we get the two-minute and 38-second Kenny Powers: Greatest Hits. It shows the promo reel “Stevie” creates in the series. We see snippets of it during “Chapter Four”, but it’s fun to check out the whole thing without interruption. Two Schaeffer Motors Commercials follow. The first goes for one minute, 22 seconds, while the second lasts one minute, 26 seconds. Both are similar, and both are pretty amusing as they show Will Ferrell’s obnoxious character. 11 Deleted Scenes run a total of nine minutes, 12 seconds. These are much closer to outtakes than they are proper “deleted scenes”. They’re essentially extensions/variations of bits that we find in the final episodes. They’re still fun, but don’t expect any unused story elements or anything. Another collection of Outtakes goes for 13 minutes, 10 seconds. These straddle the line between alternate takes and bloopers, as we get a mix of the two. I prefer the former to the latter, but this remains a good set of clips. Finally, Stevie’s Dark Secret lasts seven minutes, 32 seconds. This offers an extended deleted scene in which Stevie tells us a secret. It clearly was way too long and way too unrelated to the show’s story to fit into the show, but it’s interesting to see. Given the personnel behind Eastbound & Down, I figured I’d dislike the series. However, it actually musters a fair amount of entertainment and becomes pretty enjoyable. The DVD offers mediocre picture and audio along with a decent roster of supplements. Eastbound offers a surprisingly good series that keeps us interested for its short season.